Advance your knowledge, create new business opportunities and gain a competitive edge at the market’s premier pan-African trade and export finance gathering. For well over a decade, this has been a crucial networking and discussion forum for Africa’s corporates, financiers, trade specialists, ECAs and service providers. We’re looking forward to returning to Cape Town on March 1-2 for 2018’s event. With extensive opportunities to create new business, as well as a truly customisable delegate experience, this event will cover all aspects of trade, export, commodity and infrastructure finance, exploring innovative funding solutions available to African corporates, identifying key African hotspots and project opportunities, providing insight into credit and political risk insurance products and much more. 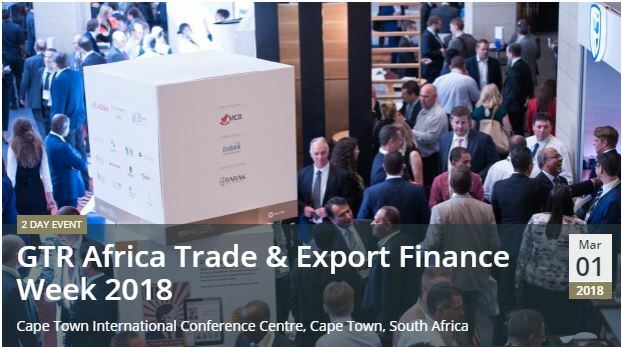 Attendance figures look set to exceed 350 delegates, meaning this is an essential place to be for anyone involved in African trade, export and infrastructure finance.